This is the second in an ongoing series saratoga living‘s doing, where we’ll be asking chefs from some of the top restaurants in Saratoga Springs to create for us the ultimate “Saratoga Bite.” The best part? You can either ask them to make you this exclusive, off-menu item the next time you’re there—or simply make the bite for yourself at home. My 2018 New Year’s resolution was to eat less meat, which has led me to experiment with more plant-based ingredients. I love chia seeds, because they’re loaded with protein and healthy fatty acids and vitamins. I’ve now made a variety of chia puddings—we ran both a vanilla and chocolate version on our brunch menu last summer. This Golden Milk version definitely checks off the H for “Health” in Saratoga’s “Health, History and Horses” motto, which is why I chose it for my Saratoga Bite. In a medium-sized pot, over low heat, combine the coconut milk, almond milk, turmeric, ginger, vanilla paste, cinnamon, honey and orange zest. Stir with a whisk and gently heat to allow the flavors to come together. When liquid is just warm to touch, pour in chia seeds. Mix together and remove pot from heat. Stir mixture with a rubber spatula for 3-5 minutes or until chia seeds begin to bloom and mixture starts to thicken like a pudding. Transfer pudding to a container and refrigerate overnight or until chilled. To serve, transfer some pudding to a cup or bowl. Top with pistachios, berries, dates, dried coconut, some additional coconut milk and a little drizzle of honey, if desired. 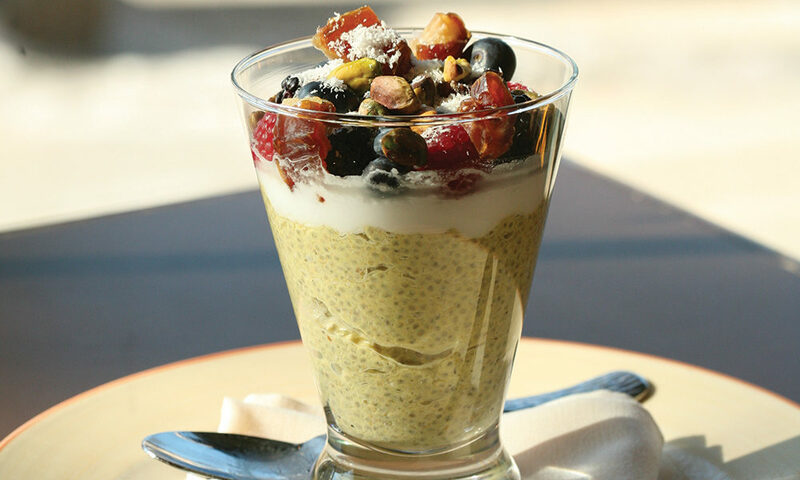 The chia pudding can also be enjoyed by itself or with other toppings of your choice.